We build a new business from Scratch every 30 days – The Bizathon Challenge! Yesterday we revealed 3 Critical Shopify Mobile Optimization Tips. 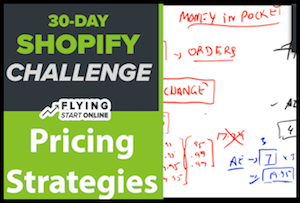 Today we cover the “Pricing Strategies” all Shopify owners need to hear. How would you like to save 3-5% on Facebook Advertising for your Shopify store? Trick question, I already know the answer! Today we reveal three pricing strategies to do just that. Remember, a successful Shopify store focuses on the numbers. The more the numbers are in your favor, the more likely you are to see profits and succeed. When it comes to pricing our Shopify products (the ones we’re getting from AliExpress) we typically charge 2-2.5 times the amount it costs us to acquire them. With that said, we also actively implement the following strategies to identify the highest converting price for our Shopify products. Properly pricing your products is a key element in the success of your Shopify business. 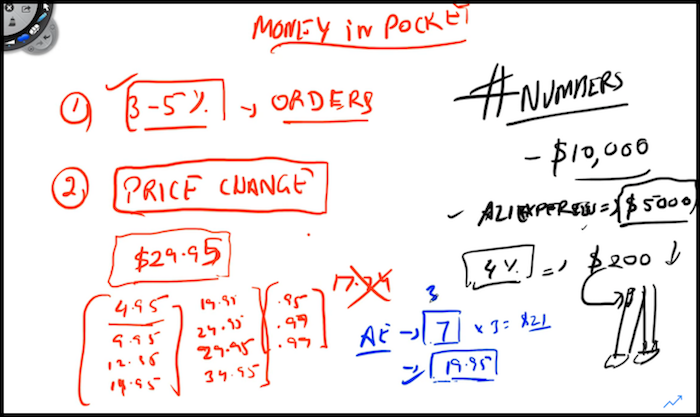 And knowing how and when to price adjust is key to your overall store strategy. Instead of just having something priced at a whole dollar value, try mixing up the cent value. Believe it or not this is a buying trigger. $.95 – $.99 are the most common cent values you’ll see associated with online stores. But that doesn’t mean you shouldn’t test others to ensure what is best for your own store. Whatever cent values you choose, be sure to implement the price change across all products in your Shopify store. Testing different prices for different products will have a humongous impact on your store profits. It’s also something, many Shopify store owners neglect to play with. I keep tabs on several popular stores, and maybe 5 out of the 40 or so that I frequent, regularly change their prices. Depending on the type of product and current demand (units being sold) compared to say 1-3 months before, it’s good practice to increase or decrease product price based on the exact increase or decrease in sales the month before. For instance, if you’ve seen a 3% decline in product sales for that 1-3 month time period, drop that products price by 3% to hopefully recover lost conversions. Eventually you should begin to identify the ideal price for each of your products based on the 3 month data you’re collecting with each subsequent price change. With each of these pricing strategies, you’re going to continue running Facebook ads to see which has the best ROI. That’s it for Day 20 – Well done! P.P.S. Click here for Day 21!